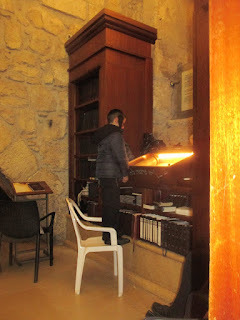 At the Kotel, early in the morning, a young Chasidic boy stands on a chair to read from the parchment scroll of Psalms that is kept in a box with a glass cover to protect it. Its handles stick out of the end of the box so we can turn the scroll. Psalms is the second most read book at the Kotel. The siddur (prayer book) being the most read, but much of the siddur is just quotes from Psalms. King Dovid authored most of the book of Psalms. It is a collection of his prayers praising Hashem, or his calling out for help. It is a wonder that King Dovid, who was called the beloved of Hashem had so many problems throughout his life. Compared to his life our lives seem so very easy. This is probably why his prayers are so dear to us. It used to be, ?about a decade back? , that the same parchment scroll in the case was at Kever Dovid, and there would usually be at least one person who would stand in front of the Kever and read the entire Tehillim from this scroll, but access to the Kever is not available 24/7 like to the Kotel, and ? maybe? that's why the donor had it moved to the Kotel.